I take part in this challenge because I enjoy seeing how things turn out. Now, I don't put as much into it as most participants do,because I am so very busy with customer quilts. But I am working at it when I can, and it gives me inspiration. for hosting this again. This link is where you can see all of the pillows. Our instructor this month is Christina Cameli, and boy does she do fantastic quilting! We were given 4 options..I chose the 4 th one, which is a tutorial on Christina's peas in a pod. It was quick and fun to quilt for me. It is great also, to see what everyone else decides to do. They surprise me every month! 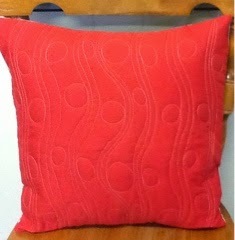 So, here is my pillow from Christina's tutorial. I like the fresh, modern look to this one. Thank you to Christina and Quiltshopgal!!!!!! Love this...your pillow turned out great. Agree, Christina's designs have that fresh, modern look to it. I have her Craftsy class and there are many designs in there that are just beautiful. Terrific pillow! Simple, yet very stylish! I like this one Marjorie. I love the way you have quilted it!